As always I know plenty and I am sure you do to so make sure you head on over to the ever so lovely The Miss Cinders and join on in the fun that is Things I Know. The first thing I know this week is that it is the last Friday in June. Which means only one thing. Red Nose Day started way back in 1988. Organisers were so thrilled with the awareness and money raised that they decided to make it a national annual event. Since then it has grown from strength to strength raising vital funds to support families in their time of heartbreaking loss. The good news is if you are not into being silly for the day and donning a red nose I know a few ways that you can be a part of this great cause. You could donate to someone like Kristie, who sadly knows only to well what a wonderful service SIDS and Kids offers, and is returning the help she received in her time of need and fundraising for this great cause. They are available online here. You can get 9 packs of 100 wipes for just under $36 at the moment. Australian made, scented or unscented and the only environmentally sustainable wipes on the Australian market these wipes tick all the boxes and they help raise funds for a vital part of our community. 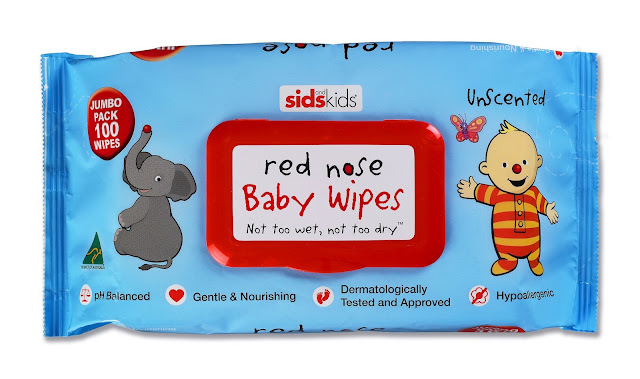 I know that if you have no need for wipes there are heaps of other cool products available at the SIDS and Kids online store. Include cards, bags, drink bottles as well as heaps of baby products. I know that if you did buy a red nose you should totally go here and enter to win a super cool prize. And even if you didn't buy a red nose you should still go there and check out all the great photos that have been shared there. I know that I am sending out lots of fairy wishes and butterfly kisses to all those families affected by the sudden loss of an infant and so thankful that there are wonderful organisations such as SIDS and Kids to support them in their time of need. Great cause. Good for you for promoting them. they are such a great cause aren't they? Bugger I meant to buy something from the chemist for rednose day and forgot!! Will get something tomorrow!! I picked up some great little soft toys with red noses on from Big W the other day. I don't know how people live through it either. Such a difficult time I am sure, I don't know how people got through it before organisations such as SIDS and Kids. Now worries Zanni, I guess I kind of felt the same about it feeling like it has fallen of the radar a bit. I know a few people who have had amazing support by SIDS and Kids. They're an organisation that is essential. Oh dear, I almost ran off and bought those amazing wipes. SIDS and Red nose day have always been a big part of our life each year. I love wearing mine each Red nose day! Yep it is so much fun wearing the nose isn't it? Red Nose Day is such a great cause. So lovely of you to promote it, Rhi.